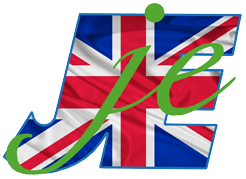 Jones engineering have been making irrigation booms for the jones engineering irrigators for a number of years now, the irrigation boom offers a strong British compact design which makes it easy to manoeuvre from field to field. 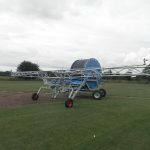 Three stage folding boom that Wraps around the irrigator real for easy transportation. Turntable so that the boom can handle angled headlands and obstacles in the field. 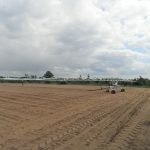 Manoeuvres between fields and within the field can be completed by one man and tractor reducing labour costs. 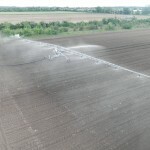 Water loss usually caused by drift is reduced with water being applied direct to crop. 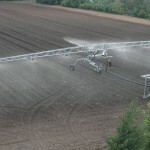 Size off droplets can be controlled, small droplets to prevent soil and crop damage or larger droplets can be selected to reduce drift. High flow rates allows faster retraction, allowing large areas to be covered in less time. Low operation pressure resulting in less wear on pipeline and components.